I had been waiting in anticipation for this festival for nearly four months and the time couldn’t go by fast enough. After attending the festival last year I told myself that it’s going to be an event that I won’t miss going forward. 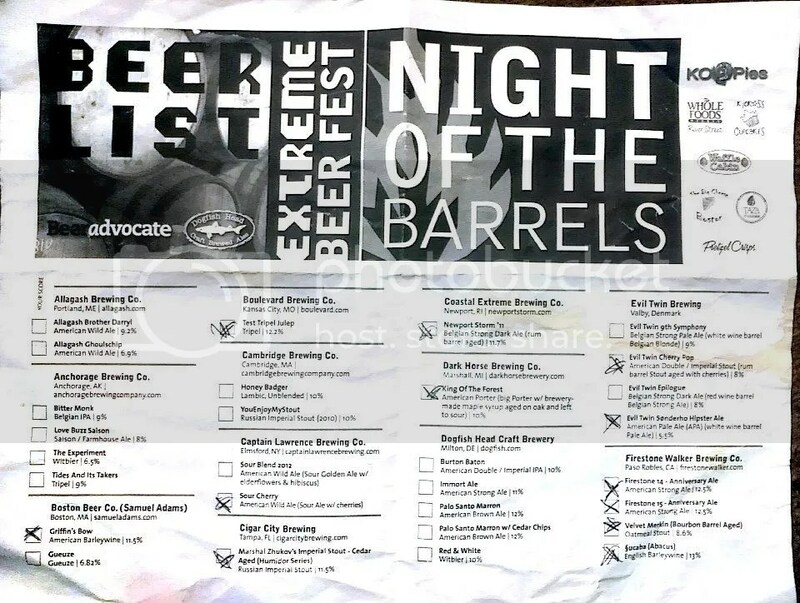 This year I decided to add Night Of The Barrels to the weekend and now I can say that I’ll have to plan on making that an annual event as well. Tickets this year went on sale in October 2011. They were made available online through the BeerAdvocate website and sold out incredibly quickly. Night Of The Barrels was sold out within 15 minutes and Extreme Beer Fest was completely sold out within the hour. The tickets went on sale at noon on a random Sunday and I sat near my computer clicking reload on my web browser for 5 minutes before the tickets went on sale so that I could be one of the first people to get my tickets. Tickets had limited sales for each session, so if you had a large group, you would have to get a few people to purchase them. I could barely sit still after making the purchase since I knew how good of a time I’d be having that weekend. Months went by and finally the festival was here. We drove up early on Friday and were able to get our hotel room and grab a bite to eat before heading to the Cyclorama in Boston, where the festival is held. Although Night Of The Barrels has food included, it’s still good to grab a bite to eat. We sat on line for about 15-20 minutes and the doors opened. The line moved very quickly and I was inside drinking Black Tuesday from The Bruery in no time. 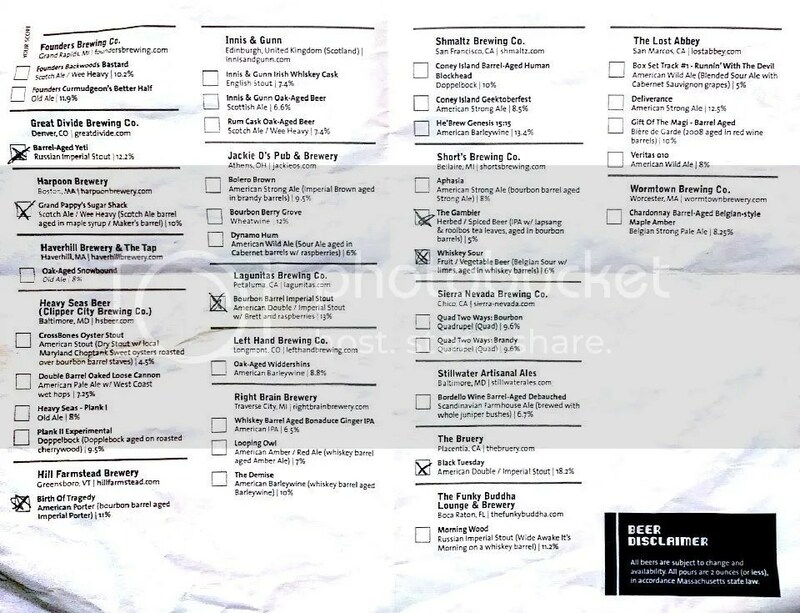 To review every beer that I tried there would be an entire book/blog in itself. Instead I’m going to give advice for going to the festival in the future. If you get tickets for next year: BeerAdvocate will release the list of beers being served a couple weeks before the event. I’d make a serious assessment of what you what to try first, and go for that. Black Tuesday from The Bruery and the beers from The Funky Buddha Lounge were completely kicked within a half hour of the door opening. Night Of The Barrels was great, but the one thing that got a little annoying was the lines. It wasn’t that the lines were long, but it was more that they were unorganized. There were a few times that I was standing around waiting for a beer to find out I wasn’t in the right line. It didn’t bother me since just about everything there was worth drinking, but it still was a little aggravating. However, by the end of the night, the lines became a little more controlled and it was easier to navigate around. I need to mention that even the longest line didn’t have anything longer than a 2 minute wait. There was basically a perfect amount of people there. I would also recommend taking advantage of the food that’s offered – especially the waffles. Easily some of the best waffles I’ve ever tasted. Other vendors had cupcakes that used Dogfish Head beer as an ingredient in the batter, Whole Foods brought some pretzels, another place brought grilled cheese and another place had craft chocolate. If you know your pairings well, it could be a great experience of beer and food. I would just recommend grabbing napkins if you decide to pick up something that could melt. I made the mistake of grabbing a handful of those chocolates and didn’t realize they were melting until it was too late. I am now forever dubbed “Chocolate Hands” by my friends who came with me to the event. 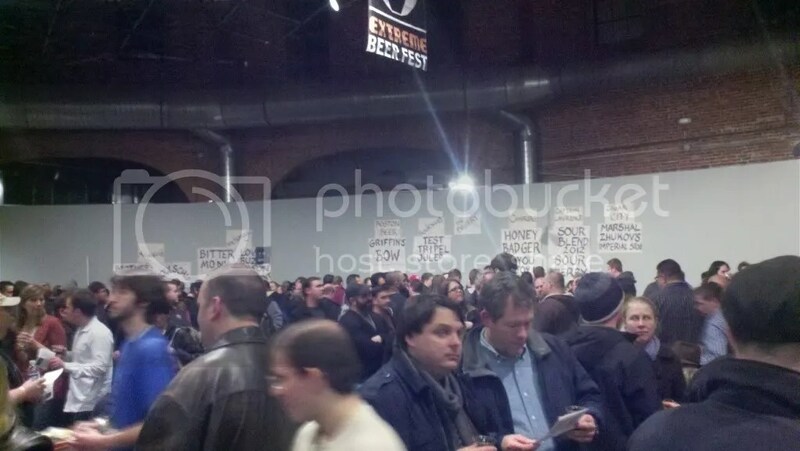 Extreme Beer Fest on Saturday was very much like the night before, except there were more beers, and they all weren’t barrel aged. There were also more people in attendance although it didn’t feel that way inside. Most of the same breweries were there, except on this night, there were actual representatives, owners and brew masters from those breweries attending the fest. I was able to talk to a lot of great people about their beer, how they made it etc. That was probably my favorite part next to the tastings. Food on this night wasn’t free, but there were a lot of the same vendors there. I couldn’t help myself from getting another waffle before I left. Needless to say, I’ll definitely be heading there next year. This entry was posted in Beer Events I Went To and tagged #allagash, Anchorage Brewery, Beer, Black Tuesday, Boston, Brewing, Canadian Breakfast Stout, Cigar City, Craft Beer, Cyclorama, Dark Horse, EBF, Extreme Beer Fest, Founders, Harpoon, Hill Farmstead, Hill Farmstead Brewery, Hops, Night Of The Barrels, NOTB, Shorts Brewery, The Bruery, The Funky Buddha Lounge. Bookmark the permalink.